Know the Best Career option after 10th or 12th. What to do after 10th or 12th Board Exam. How to choose your career as IAS. 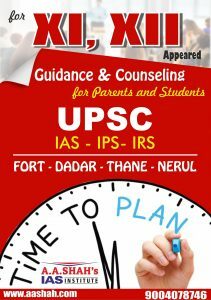 Civil Services Exam popularly known as IAS Exam is conducted by UPSC (Union Public Service Commission) every year. It is a combined exam to recruit officers into Indian Administrative Service (IAS), Indian Foreign Service (IFS), Indian Police Service (IPS), Indian Revenue Service (IRS), Indian Audit and Accounts Services, Indian Railway Traffic Service (IRTS)and several other GROUPA & GROUP B Central services. The objective of foundation course is to sensitise the aspirants with the essential knowledge and skills which will lay a sound foundation for his/her pursuit in Civil Services Examination. Considering the maturity level of the aspirants, a phased approach is recommended. Accordingly the foundation course will be introduced as the first stage in the course of preparation before Prelim and Mains preparation stages commence. They will have a clear edge over fresher’s in their year of attempting Civil Services Examination. Video lectures of guidance sessions, seminars, workshops for UPSC Civil Services Exam and preparation…. IAS Topper Sathish B Krishnan 2017 AIR 125 (Student of A A Shah's IAS Institute, Mumbai) :Unique way of motivating IAS aspirants. Guidance lecture, must watch for candidates of UPSC - CSE. A A Shah′s IAS has launched ‘Mentorship 2017’ online course for personalized mentoring, study support, doubt solving, writing skill improvement with personal touch & much more. Academic Head of A A Shah′s IAS Institute. What sources to read, watch and listen for IAS Exam Preparation by experts from from the field. 11 /2 Hours a Day. 3 days a Week 2 Hours a Day. 3 Days a week 40 minutes a Day. Introduction to CSAT (Civil service Aptitude Test) Classroom physical lectures based on Prelims syllabus of General Studies, Current Affairs & CSAT papers of Civil Services Prelim Exams of UPSC including Online Test Series Recorded lectures based on Prelims syllabus of GS (General Studies): Polity, History, Geography, Economics.